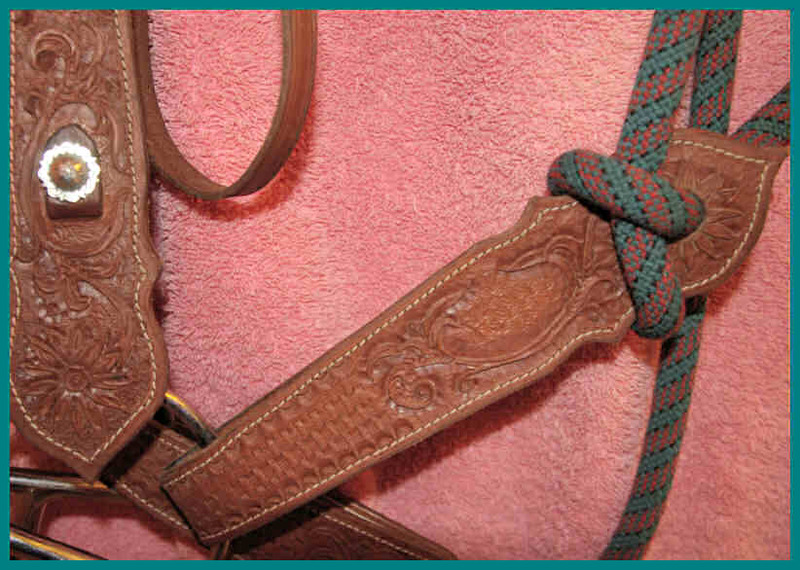 Lovatt & Ricketts Eventer saddle SOLD!! Smith Worthington Danzig, long flap with fittings SOLD!! 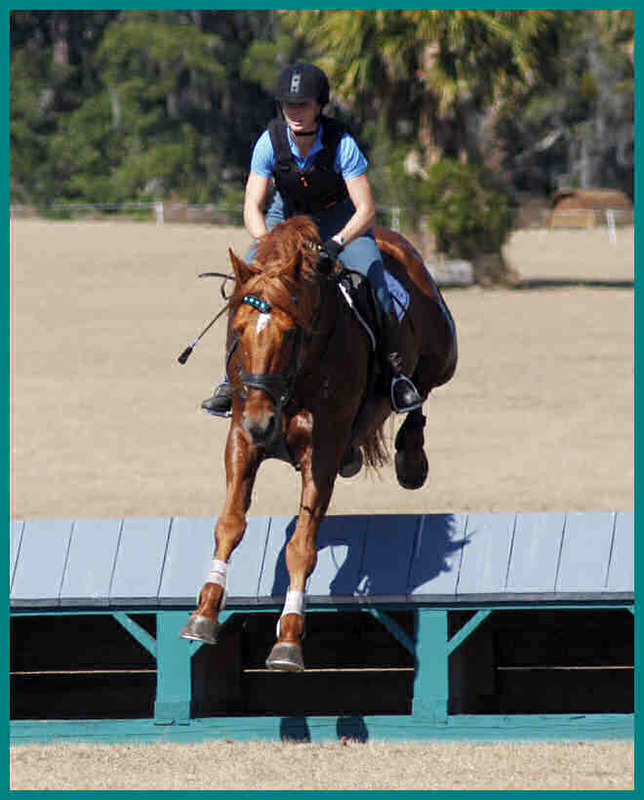 schooling cross-country and having a blast in his custom browband. 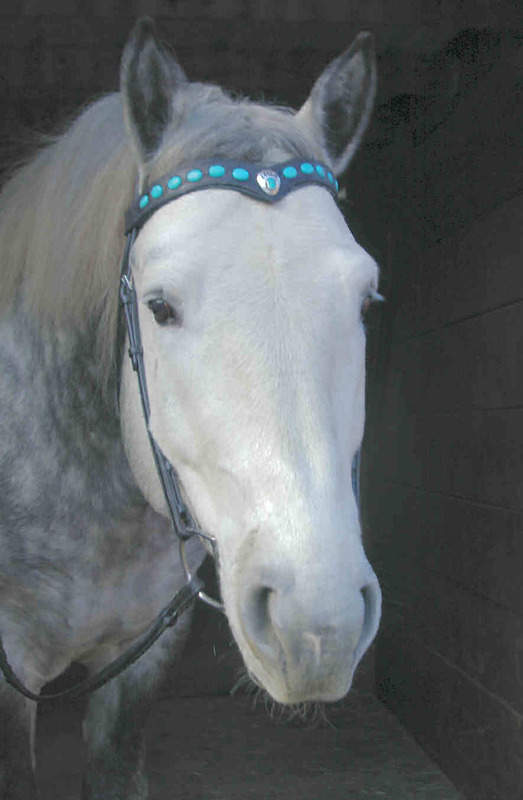 with inset genuine turquoise stones to set off his lovely face. 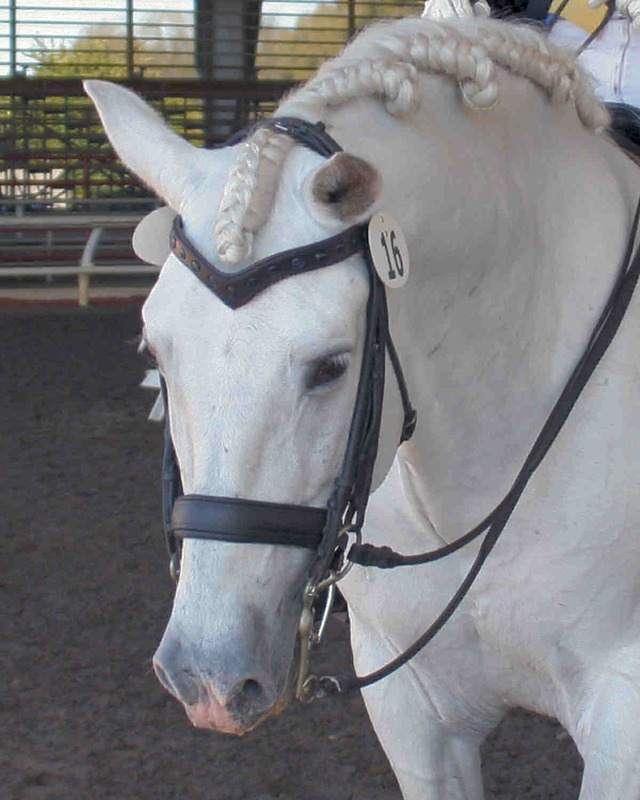 The exquisite PRE stallion Amando, owned by Lee Burton, St. Simons Island, GA at the completion of his first Grand Prix Freestyle, Region III, modeling a narrow vee browband in black leather with inset AA Lapis Lazuli ovals. Made to order, this is an Award donated for the Irish Draught Dressage Champion for the NWSHBA, Laura Gravatt's lovely girl Snowy O'Moment; modeled by our Champion Irish Draught Sporthorse filly, Pretty Please. 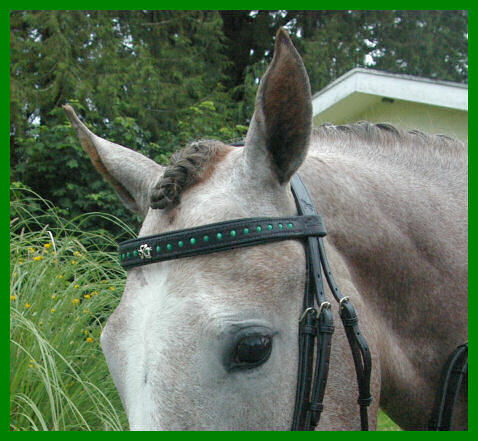 It has the same sterling shamrock sported by the Irish Team WEG browbands, and pretty pink catseye stones. 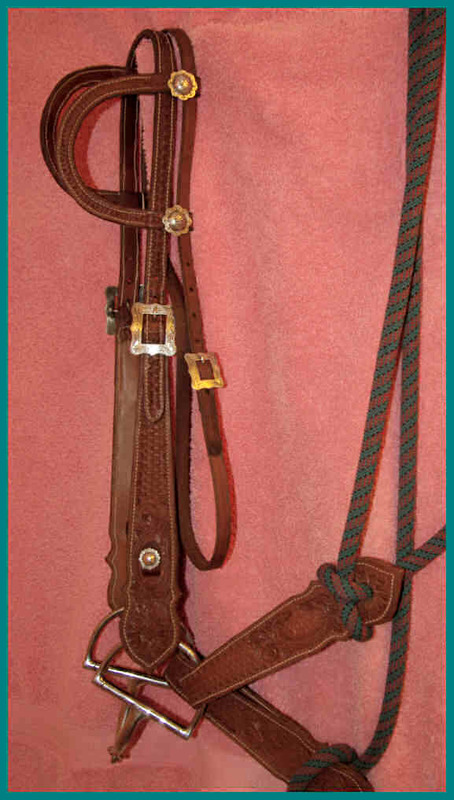 Above browband modeled by Dare to be Blue is 17 inches long, ( a bit long for this mare) and approximately 1-1/4 inches in overall width including the padding. 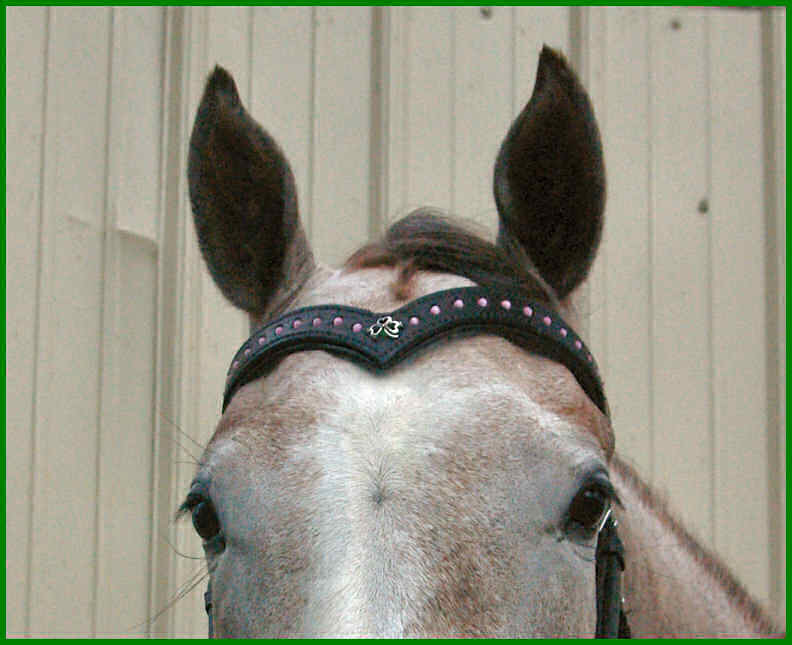 One of a custom order group of "Team Irish" browbands, commissioned for the Irish Horse Demo Team who demonstrated at WEG in Lexington KY. Sterling shamrock center, green Catseye stones, in fine black bridle leather with black padding. Modeled by the lovely Pretty Please. 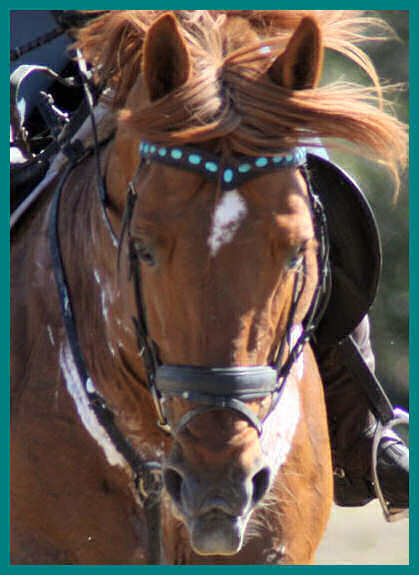 ASK about custom work - we can make browbands to any size you require, and have many design possibilities using natural semi-precious gemstones - no tacky costume jewelry! All stones are securely set into the leather for no snagging or rubbing off. 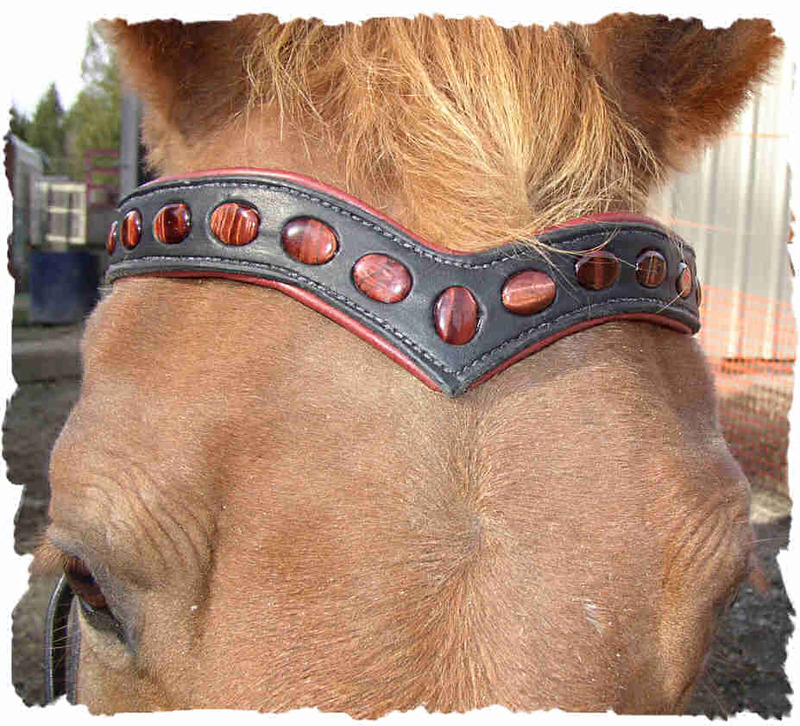 Pricing on gemstone browbands starts at $150 plus mailing; more expensive stones, silver adornments, etc., will increase pricing. 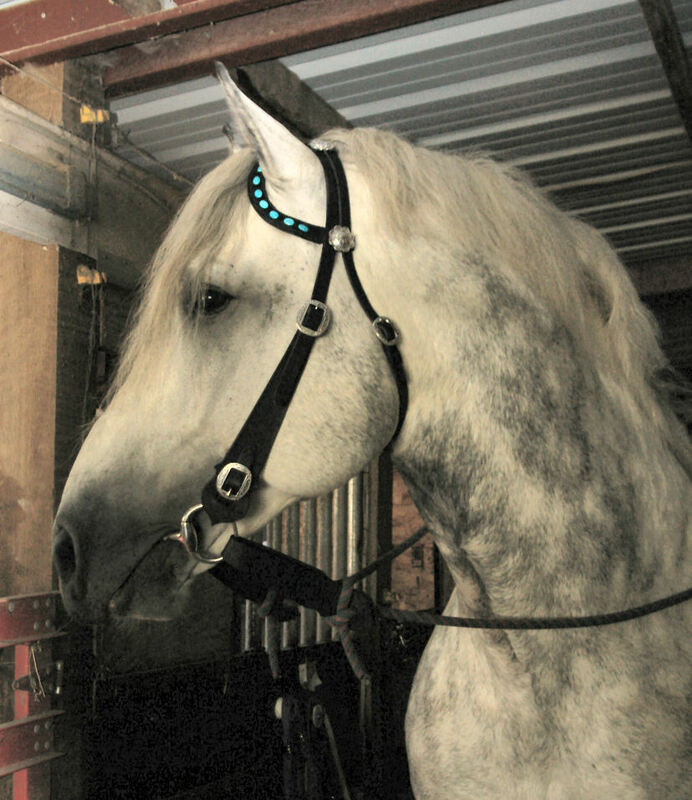 Each browband is made to order and is individually unique - no mass production here! 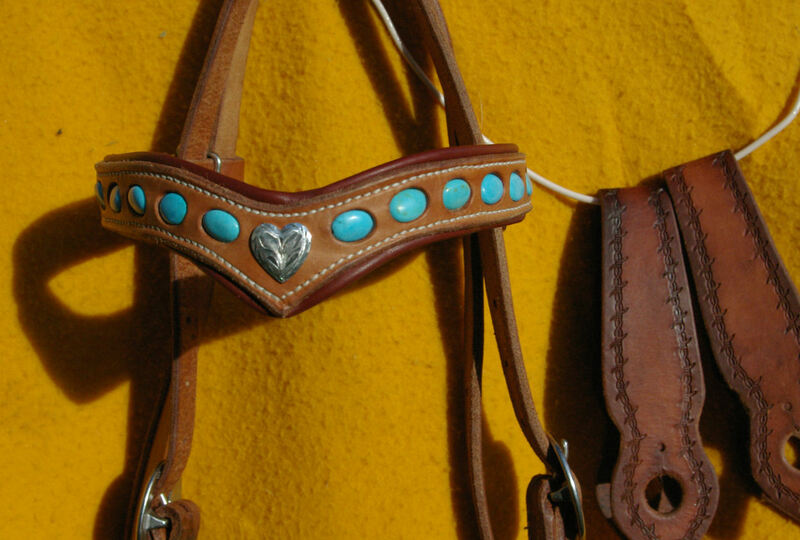 Custom made bridle, good skirting leather over lush chap padding, inset genuine turquoise stones with a sterling overlay heart concho . Jeremiah Watt stainless hardware. 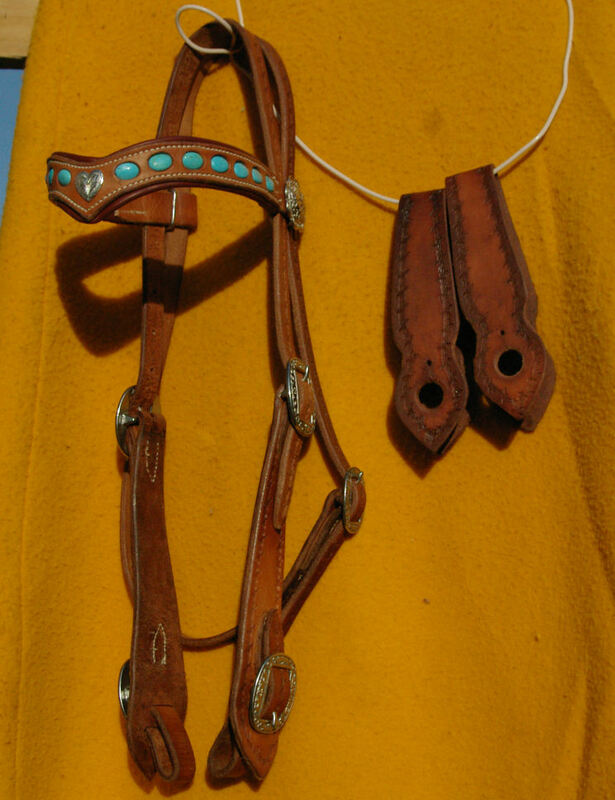 Custom made bridle, good skirting leather over lush chap padding, inset genuine turquoise stones with a sterling overlay heart concho. Jeremiah Watt stainless hardware. 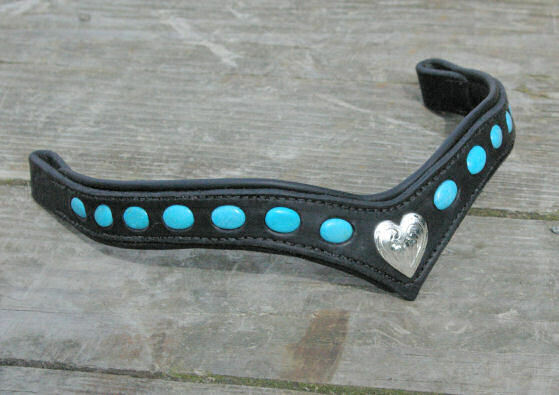 Custom made browband, 7/8 inch black bridle leather strap over black chap padding, inset genuine turquoise stones. The one-inch sterling plated heart accents this narrower band, ordered at 16-7/8 inches in length for a very special horse. Sterling bear's paw shadowbox centerpiece with turquoise stone to accent the inset turquoise ovals. 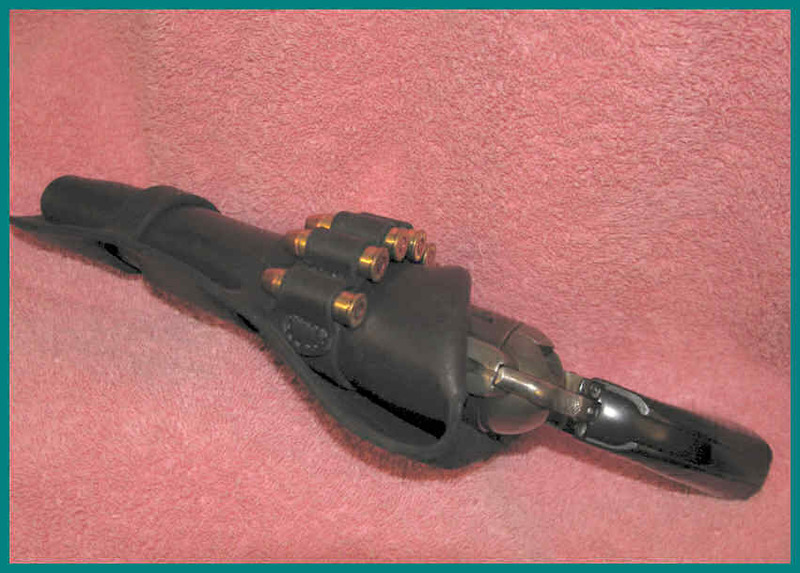 This 1-3/8 inch wide band is of soft black latigo leather over black chap padding. 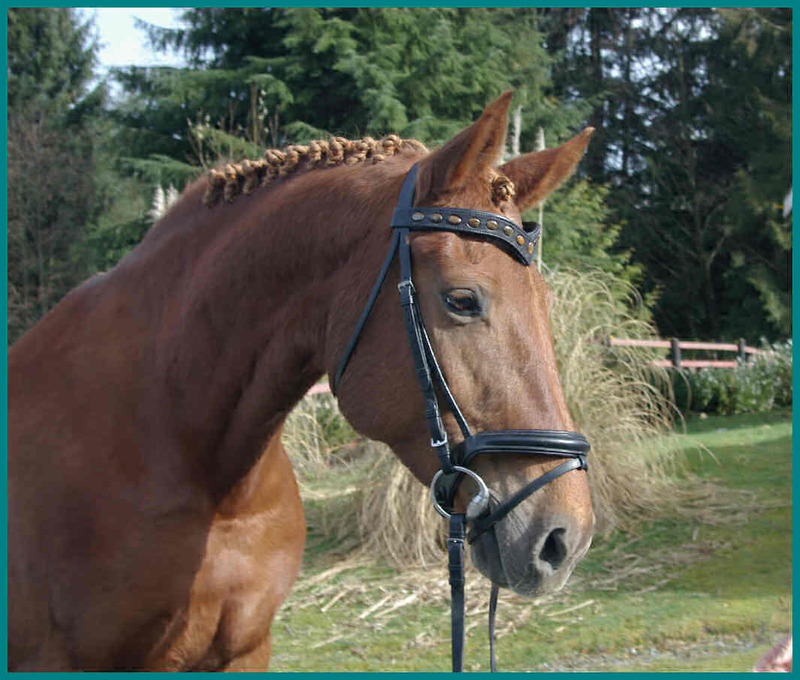 Modeled by our purebred Irish Draught Stallion, Manu Forti's Touch Down RID, this browband measured 17.5 inches and was perfect for the Knabstrupper stallion who now wears it. 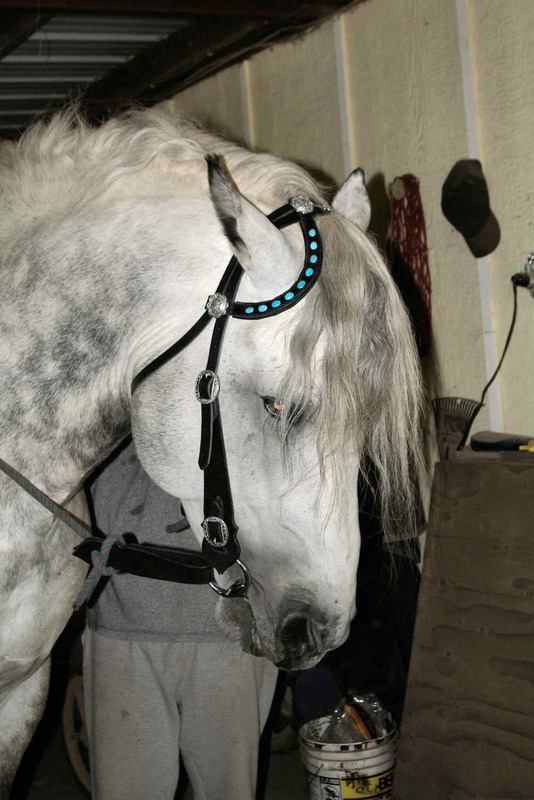 Custom made bridle, 3/4 inch black bridle leather strap over black chap padding, inset genuine turquoise stones. Stainless steel Jeremiah Watt hardware . Donated to the IDHSNA Annual Show Silent Auction. 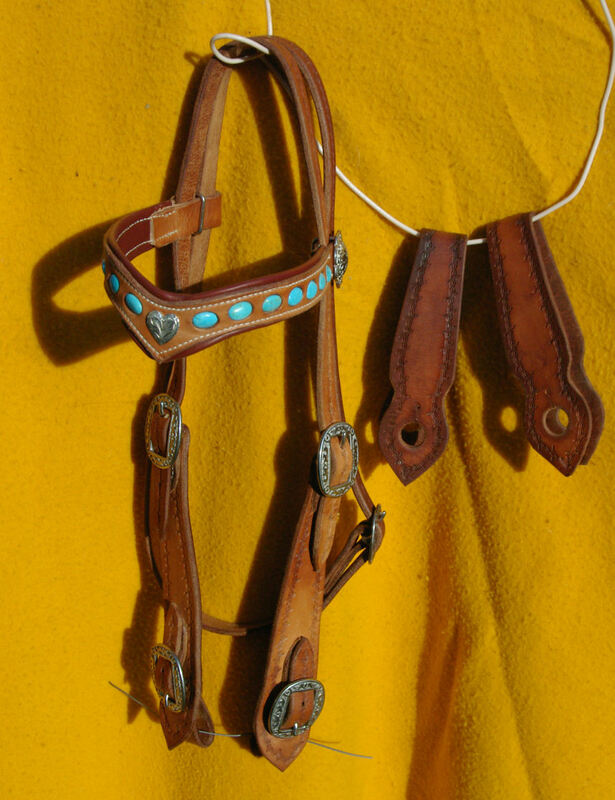 Two ear bridle withthe inset turquoise ovals. The earpieces are stitched over black chap padding. High resolution photos available to serious inquirers. See my rawstock inventory page for more stone options. 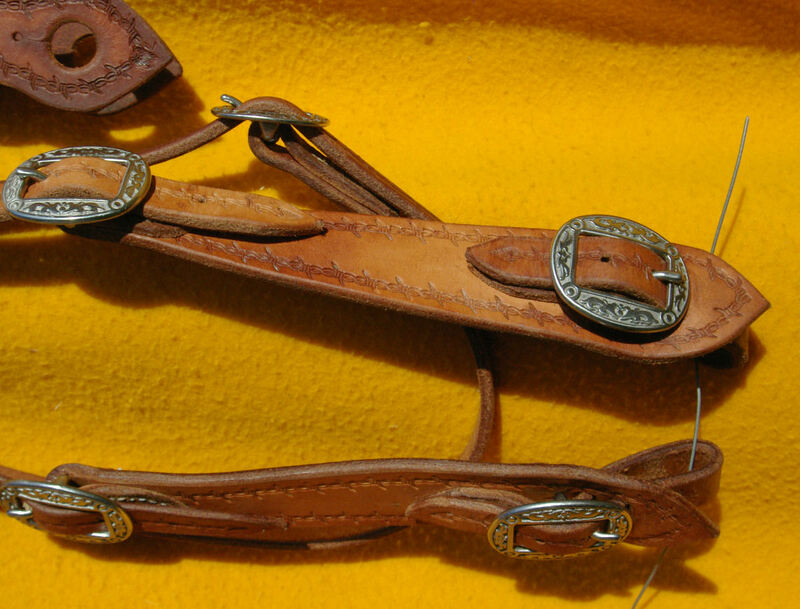 Crafted of Vitan leather from Siegel of California, this bridlecreated over 8 years ago, was made up with vintage solid sterling buckles and conchos that took me over a decade to accumulate the matching set. It is irreplaceable! The Sgt. 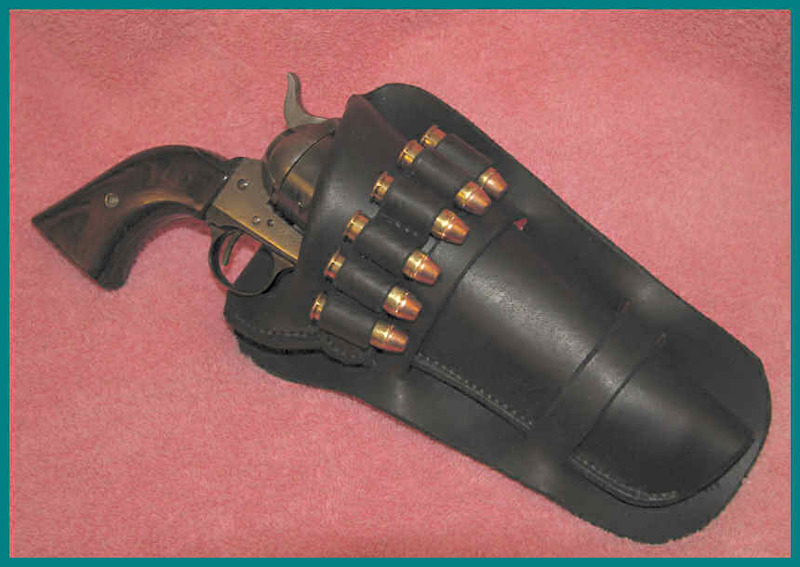 Walter Deaves Patton (WDP) holster. Reproduced from photographs and scale line drawings of the original, which dates back to the Spanish American war, for Sergeant Patton's grandson, Dan Patton. This is authentic Americana, a warrior's gear. I am honored to have been asked to recreate Dan's family history for him. 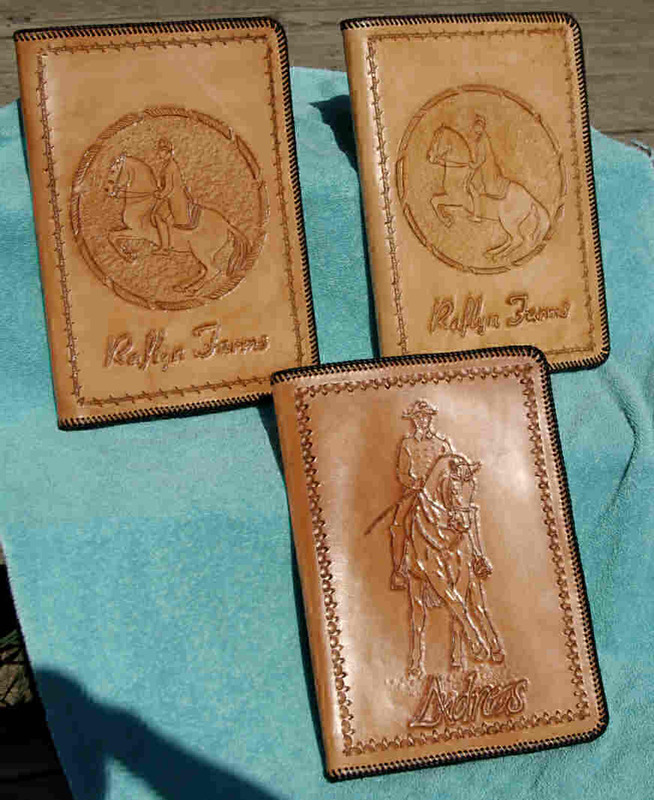 Custom leather portfolios commissioned by Raflyn Farms Dressage Center for the 2009 Andreas Hausberger clinic. 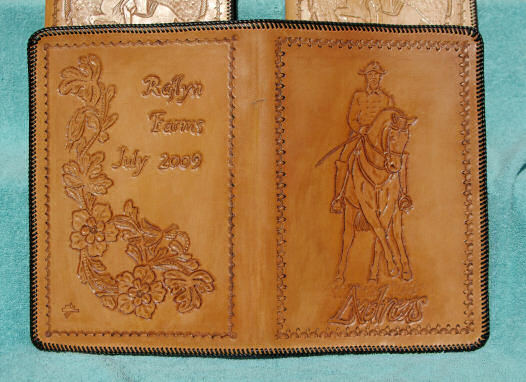 I also do custom concealed carry gunleather.